Fifteen years ago two Boston scientists, Daniel Simons and Christopher Chabris, were studying selective attention. They devised an experiment that has become a classic in psychology: subjects were shown a video of two teams of teenagers — one team dressed in white and the other in black — passing two basketballs between the players while weaving around one another. The subjects were instructed to focus on a single task: counting the number of times the team in white passed the ball. This task was not as easy as you might imagine — you can try yourself by clicking here — because the basketballers were constantly moving. About mid-way through the video a man in a gorilla suit wandered into the middle of the players, stopped for a moment, beat his chest and then nonchalantly strolled out of the picture. All research subjects managed to record the number of passes correctly but when asked “Did you see the gorilla?” less than half said “yes”. Inspired by this paradigm, Trafton Drew from Harvard University has recently completed a project with a group of radiologists. 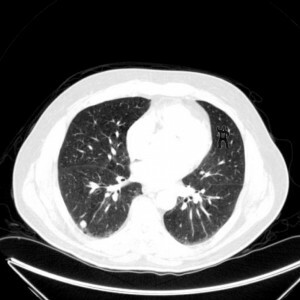 They were asked to study five CT scans of patients’ lungs, each of which had 10 cancerous nodules, and told to click on anything strange or suspicious. On the last of the scans, a dancing gorilla almost 50 times the size of a typical nodule was inserted in the upper right quadrant of the CT scan (click on the image below and see if you can spot the gorilla). Drew’s findings will soon be published in Psychological Science and show that the radiologists identified the nodules correctly 55% of the time. However, 20 out of 24 failed to see the gorilla despite scrolling past it, on average, at least 4 times. Using eye-tracking equipment, Drew showed that the radiologists spent 6 seconds studying the image with the gorilla while half of them looked directly at it. While one radiologist has commented that this study “has no bearing on what we’re looking for, which is real pathology, not dancing gorillas”, there is another point of view. An orthopaedic surgeon in Cape Town recently found himself in trouble for not asking his radiological colleagues to review his X-rays of a patient’s shoulder joint he’d operated on. It turns out that the surgeon had missed the presence of a cancerous nodule in the apex of his patient’s lung. Clearly, all clinicians should guard against “inattentional blindness”. Very interesting – counted 10 passes but easy knowing the gorilla was going to appear so forced oneself to ignore it!! Thanks for interesting articles! !